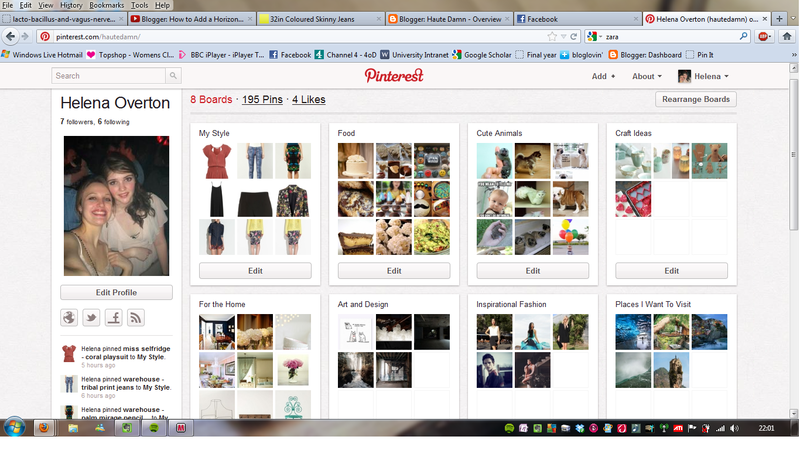 Pinterest has been around for a while now, but for some unknown reason I only decided to look into it last week. I'm literally kicking myself now as it is THE most amazing thing in the whole wide world!!!!! Whoever created this...I love you. It is basically a really good way of storing all your inspiration for your future home, for example, or a place to keep all the clothes you want without keeping a million tabs open. And it's so easy to use. When you have found a picture/recipe/ item of clothing you love, you just press the 'pin it' button on your bookmarks tab and it pins it straight to the board you choose on your home page. I have to warn you though, I have done no work since getting an account as it is extremely addictive. I'm planning on having a 'pinning party' with my bessies in the near future, which is us pretty much sat in my kitchen eating naughties, drinking wine and pinning. I honestly could not think of a better night in! You can have as many boards as you like on your page. I think I may have to start to split 'my style' board into different trends or different items of clothing....keen much?